"Mommy, Daddy measured me yesterday. Want to see?" "Sure, Brian," I enthusiastically replied. The last time we measured Brian was at our old house - a whole year ago. He was excited to show me how much he had moved up on the measuring stick. 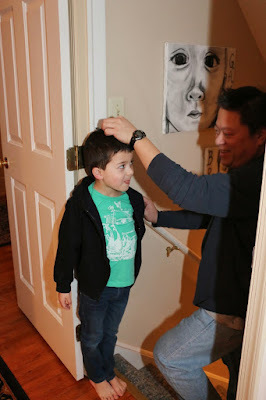 Ed started measuring the boys on the door jamb going down to our basement on January 28, 2013. Gavin was 5 years and 4 months old. Brian was 4 years and 1 month old. That was the first and last time we would mark Gavin's height on that wall. He would be gone just 77 days later. Brian has been measured 13 more times since that day - and Hope once. But Gavin's measurement will always stay the same. He was 3 feet, 4 inches tall. But, as we know, height most certainly does not measure heart. "Mommy, it's too bad you didn't measure Darcy on the door before she died," he said. "I couldn't, buddy. Remember how I told you that Darcy never came home from the hospital? That she died inside of me right before she was born?" I reminded him. "Oh, right. So, how big was she when she was born?" he asked. "Not big at all. I could hold her in one hand," I explained. "We had brought a little outfit to the hospital for her and it was way too big!" "Did you hold her?" he asked. "I did. I held her all day. I held her for over five hours." I told him. "And then what happened to her? Where did you take her? Where is she now?" he carefully asked. I knew where this was headed. It was time. Since Gavin died, I have made a promise with Brian that I will always be honest with him. If he has a question for me, I will answer it. Always. 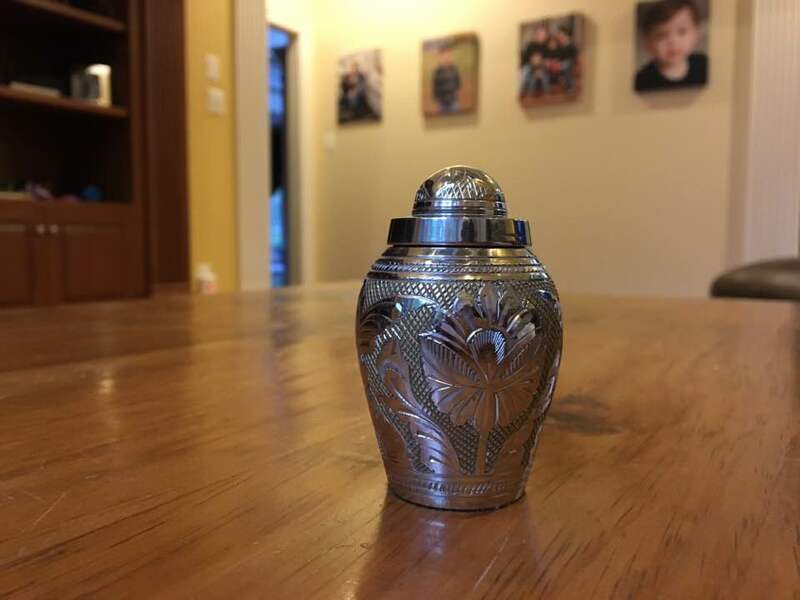 I also decided to follow his lead as he navigated his own grief journey. I knew he would know what was best for him - and we vowed to support those things. When he made the decision to take over his brother's room and sleep in his bed (which he still does) - we fully supported him. When he decided to continue to be tucked in at night under the very blankets that covered Gavin in his hospital bed - and sleep on the pillow cases that Gavin's head rested on as he was dying - we supported him. It was just this past December that he asked me about organ donation. (You can read how I delicately explained that in this post.) I knew when he asked that he was ready to hear the answer. I thought for sure that talking about organ donation would prompt him to ask what happens to our bodies when we die, but he didn't. Today was the day - and I was prepared. At least I hoped. "So, remember how we talked about organ donation - and how our bodies are like suitcases? All the important things are packed in our suitcase - but when we get to where we need to go, we unpack that suitcase and we don't need it anymore! Remember that?" I started. "And remember how I told you that the important things in our body's suitcase are things like our soul and our spirit and all the love we have for everyone. Those things are what meet Jesus in Heaven after we die. Our bodies aren't needed in Heaven!" I explained. "So, what about our heart? Does that go? Or our brain?" he asked. "Nope! Our heart and our brain stay here - but the love in our heart and all the memories in our brain will be with us in Heaven. As a matter of fact, once you're in Heaven something magical happens. You can feel even MORE love there - and you can remember your WHOLE life. You might even remember when you were a tiny infant!" I told him. "Are you ready to hear what happens to our bodies?" I asked. "When people die, their loved ones have a choice about what to do with their body. When Pop died, Granny decided to have his body put into a casket. After the funeral is over, the casket gets put into the ground at a cemetery. You know when we go to visit Pop's grave and you see the stone with his name on it? His body is under the ground in the casket right there!" I explained. "Woah. So Pop is there? We were standing on top of him?" he asked. "No - not really. Pop's 'suitcase' is there. But Pop's spirit and his soul and all the wonderful things that made him 'Pop' are now everywhere around us! He may be with us at this very moment! Sometimes Hope tells me that she sees him in her room!" I replied. "That's crazy! Hope didn't even ever meet Pop!" he exclaimed. "I know, right?!?" I said. "Heaven and being with Jesus is so magical and loving that Pop can be anywhere he wants - and with anyone he wants. He was probably with us when we were at the cemetery. He is definitely with Granny right now... and he may even be right here in the den with us, too! And he doesn't need his body to get from here to there! Heaven is an amazing place to be which is why we should never fear death." "Are you wondering what happened to Darcy and Gavin's bodies?" I carefully continued. Again, he pulled the blanket up over his eyes... wiped away tears... told me to wait a second so he could make himself laugh, you know, to balance out the tears... and soon he announced he was ready. "So, Daddy and I agreed that we couldn't bear to bury Darcy or Gavin in the ground and leave their 'suitcases' - or bodies - somewhere away from us. We wanted their bodies with us all the time! So we chose something called cremation." I took a deep breath and gave myself an inner pep talk. You can do this, Kate. You prepared for this. 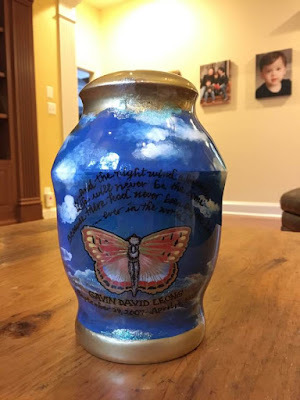 "Once Gavin died and we knew he was with Jesus in Heaven... and the surgeons were done making sure that Gavin's healthy kidneys got to the man who needed them... he was done with his body. That's when the funeral director brought Gavin to where he has this magical kind of box - and this is the part that is so, so special, Brian - they turned his body into SAND!! We knew how much Gavin loved the beach and how happy he was there, so sand seemed like the perfect choice." "Because his body was sand, we could keep it with us wherever we are! We made the same choice for Darcy, too. 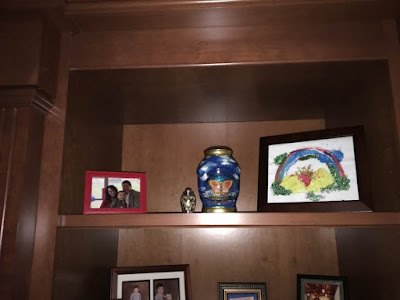 So...." and I stood up and motioned towards the shelf to the two urns that have always been displayed right under his nose. His face lit up, he smiled and asked, "Is that where the sand is? In those things? I thought they were just furniture things! Can I hold them?" he blurted out quickly. "Sure! Let me get them down. " I pulled them down and placed them on the coffee table in front of us. He remarked how Darcy's was so tiny and I explained that was because her body was so tiny. "I wanted something that was really delicate and pretty for Darcy because I know she would have been just that - as pretty as her sister, Hope," I told him. For Gavin, I wanted something really unique because that's exactly what he was! There was no one like Gavin, don't you think?" I asked. "I found this wonderfully kind woman who designed this just for us. I told her I wanted it to be a combination of the ocean waves meeting Heaven in a magical explosion of beauty. So the bottom looks like sand... and then ocean waves... and then puffy clouds in the sky... until you see the glittery golden top that symbolizes the paradise of Heaven. You like that?" I asked. "I do. It's really nice that she did that!" he said. "That's true, don't you think? There has never been anyone like Gavin - ever in the world?" I asked. "And what's this?" he asked as he pointed to the dates. "Yes, my birthday was the day that he died," I reminded him. "Thank you for telling me that, Mommy." Tonight, tucking him in under Gavin's blanket, I asked him what he thought of our talk about cremation. I figured the first thing he blurted out might be the thing he had been thinking about the most all afternoon. His reply surprised me... kind of. "I was just thinking about the 'sand holder' - what's it called again?" he asked. "Right. I really think Gavin would like that you made it beachy and had the ocean and the sky and his name - and the blue. Gavin loved blue," he told me sweetly. "Thanks, Brian. I think he'd like it, too. You know what I think about when I look at it? That the moment that Gavin met Jesus probably felt like he was surrounded by ocean waves and golden light right when he saw His face - two of his favorite things... water and lights. It was probably such a magical experience. I am so happy for him because I know he is happy. Even though I still would rather him be with us - and Darcy, too." We sat in the glow of his night lights for what felt like a solid minute before I heard a soft, "Mommy?" 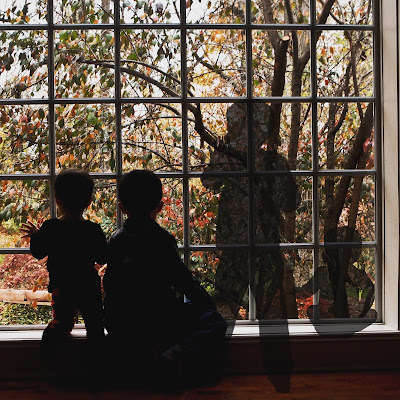 "Sometimes people ask me how many brothers and sisters I have and I just say two," he seemed nervous as he told me. "Brian. Guess what? Sometimes people ask me how many children I have and I say the same thing. Sometimes it's just easier to say two because you don't want to make the other person feel bad when you explain. And sometimes I say four - and that's okay, too! There's really no wrong answer - I promise. 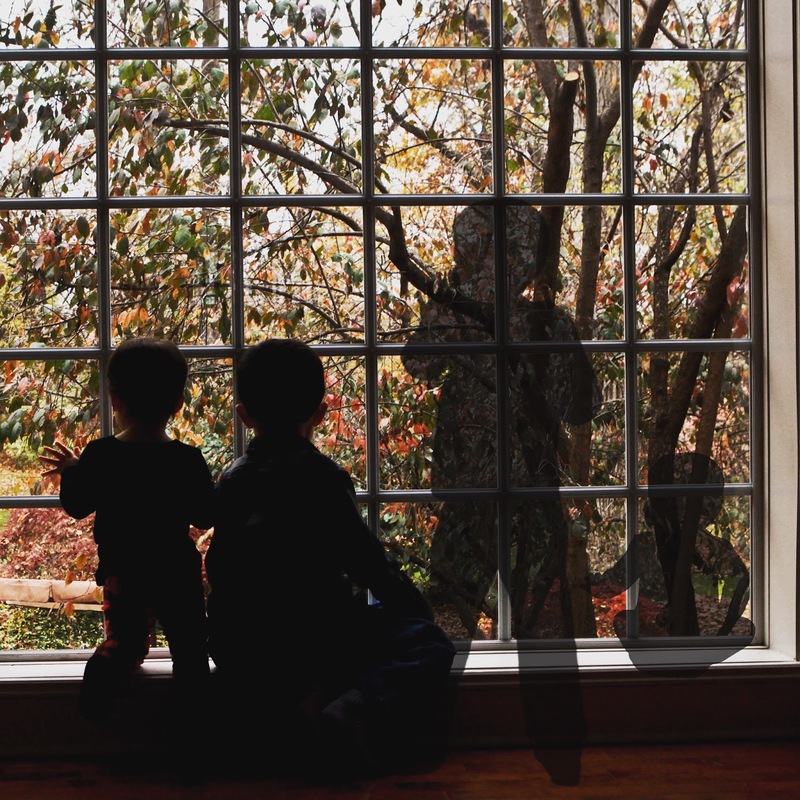 Gavin and Darcy know that they are your brother and sister - and they are always with us, even if others can't see them." As I kissed his head one last time and turned to walk out of his room, I thanked Gavin and Darcy for giving me just the right words to get through this day. Brian asked when he was ready - and somehow I was ready, too. Hugs to you dear Kate! You explained death/ cremation/casket to Brian in such a way that was positive , not scary! i got choked up just reading !! You are a brave momma bear with an amazing cub, who is wise beyond his years. Blessings to all of you! What a beautiful post and how much wisdom God has given you to explain things in a way that is meaningful and beautiful and so simple so he can understand. God bless all of you. I love you all and am so thankful I follow your blog. It is such a blessing to me and so many others. That was a beautiful and perfect way to explain death, burial and cremation. I hope you don't mind, Kate, if I use it when my 3 grandchildren ask about their grandfather. You have a wonderful way with words! Kate you are a remarkable woman, putting these memories in a way that Brian can understand them. It is a wonderful gift you have. Bless you. What a wonderful explanation. I read with a lump in my throat and tears in my eyes. Love to you all. Thank you for sharing this...it warmed my heart and soul. That was beautiful. What a wonderful, beautiful way to explain.